In 2019, organizations must reimagine their digital commerce strategies by leveraging emerging technologies and business models. According to Gartner, new business models, such as subscription-based ordering and enterprise marketplaces, enable sellers to generate new revenue streams and focus on customer outcomes. 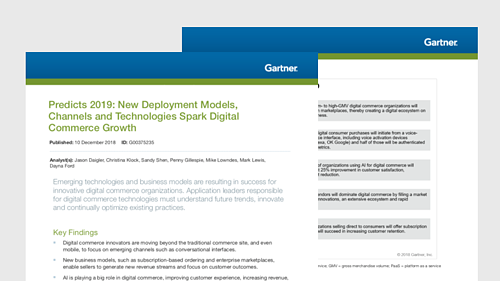 In this report, Gartner identifies the emerging technologies and business models that are resulting in success for innovative digital commerce organizations. Predicts 2019: New Deployment Models, Channels and Technologies Spark Digital Commerce Growth, Jason Daigler, Christina Klock, Sandy Shen, Penny Gillespie, Mike Lowndes, Mark Lewis,Dayna Ford, December 10, 2018.